The cross-lingual semantic annotation links the linguistic resources in one language to resources in the knowledge bases in any other language or to language independent representations. 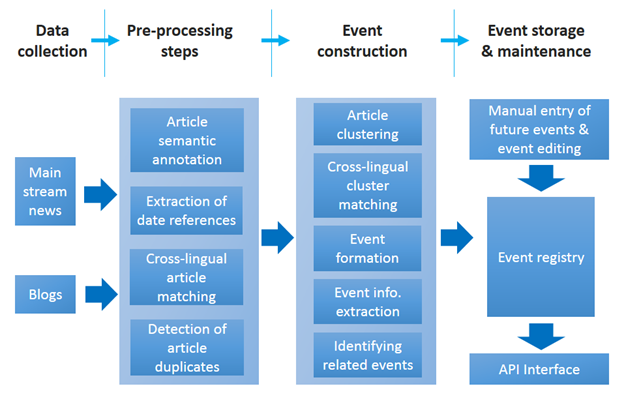 This semantic representation is later used in XLike for document mining purposes such as enabling cross-lingual services for publishers, media monitoring or developing new business intelligence applications. 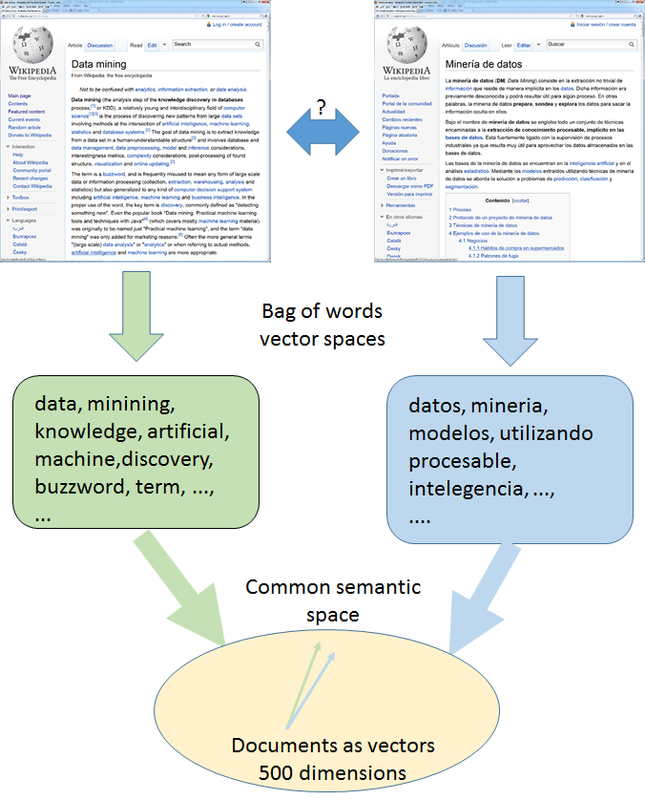 The goal is to map word phrases in different languages into the same semantic interlingua, which consists of resources specified in knowledge bases such as Wikipedia and Linked Open Data (LOD) sources. 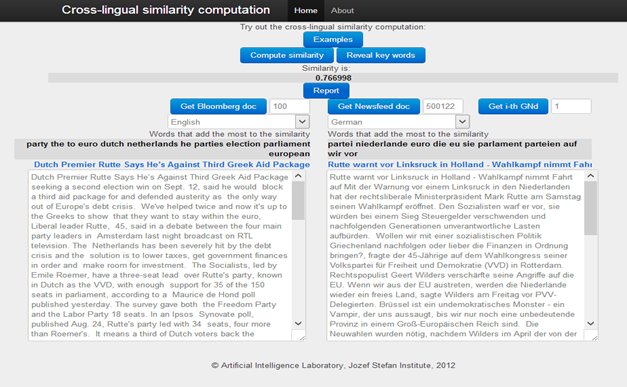 Cross-lingual semantic annotation is performed in two stages: (1) first, candidate concepts in the knowledge base are linked to the linguistic resources based on a newly developed cross-lingual linked data lexica, called xLiD-Lexica, (2) next the candidate concepts get disambiguated based on the personalized PageRank algorithm by utilizing the structure of information contained in the knowledge base. The xLiD-Lexica is stored in RDF format and contains about 300 million triples of cross-lingual groundings. It is extracted from Wikipedia dumps of July 2013 in English, German, Spanish, Catalan, Slovenian and Chinese, and based on the canonicalized datasets of DBpedia 3.8. More details can be found in . xLiD-Lexica: The cross-lingual groundings in xLiD-Lexica are translated into RDF data and are accessible through a SPARQL endpoint , based on OpenLink Virtuoso as the back-end database engine. Semantic Annotation: The cross-lingual semantic annotation service is based on the xLiD-Lexica for entity mention recognition and the Java Universal Network/Graph Framework for graph-based disambiguation. 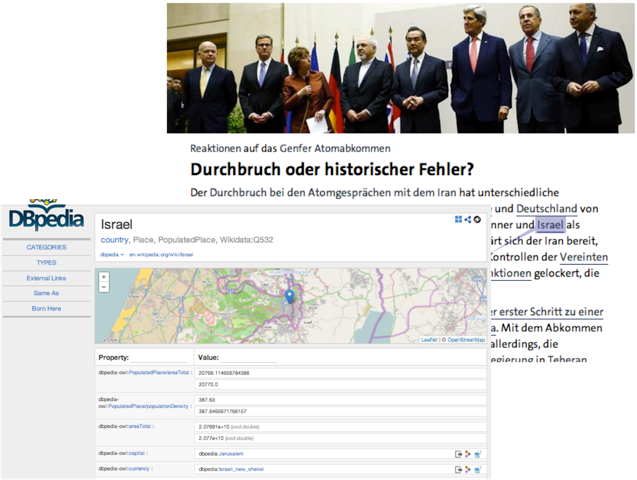 An example of the service for annotating the XLike website using DBpedia in German is accessible under the URL . 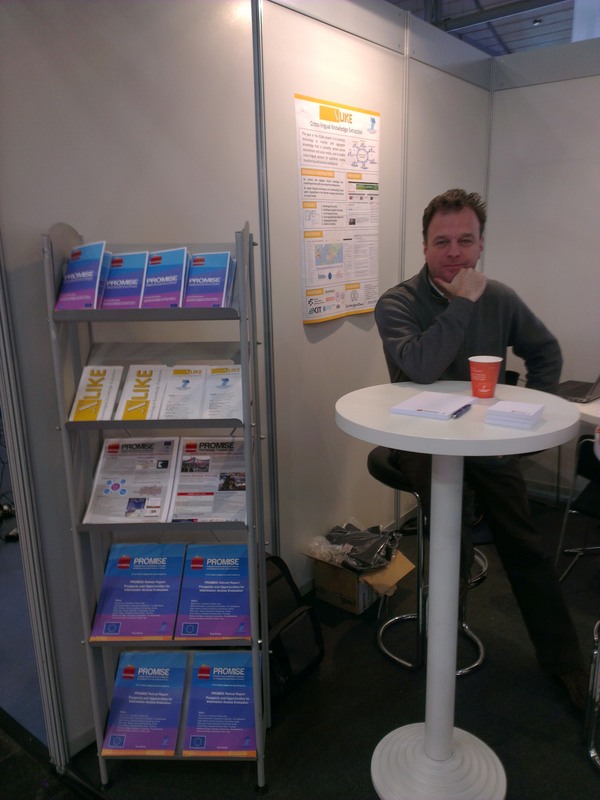 We are presenting results at CeBIT 2013 in Hanover. If you are around, you can visit us in hall 9, stand D25. Measuring similarity between documents written in different languages is useful for several tasks, for example when building a cross-lingual content based recommendation system. Another example is tracking how news spreads which may involve crossing different languages. Having a cross-lingual similarity function and a common representation which is language independent enables us to transform cross-lingual text mining problems (CL-classification, CL-information retrieval, CL-clustering) to standard machine learning techniques. Below we illustrate how to construct the language independent document representations as well as the cross-lingual similarity function, based on a multilingual document collection (training data). (LSI) Primoz Skraba, Jan Rupnik, and Andrej Muhic. Low-rank approximations for large, multi-lingual data. Low Rank Approximation and Sparse Representation, NIPS 2011 Workshop, 2011.B [link]. (CCA) Cross-lingual document retrieval through hub languages. V: 2012 Workshop book : NIPS 2012, Neural Information Processing Systems Workshop, December 7-8, 2012, Lake Tahoe, Nevada, US. [S. l.]: Neural Information Processing System Foundation, 2012, 5 str. [link]. Both approaches use the Wikipedia alignment information to produce the compressed aligned topics. That enables the mapping of documents in language independent space. Data compression and multilingual topic computation in LSI case is done using SVD – singular value decomposition to reduce the noise and the complexity of similarity computation. In CCA case we first compress the covariance matrices using SVD and then refine the topics using generalized version of CCA. 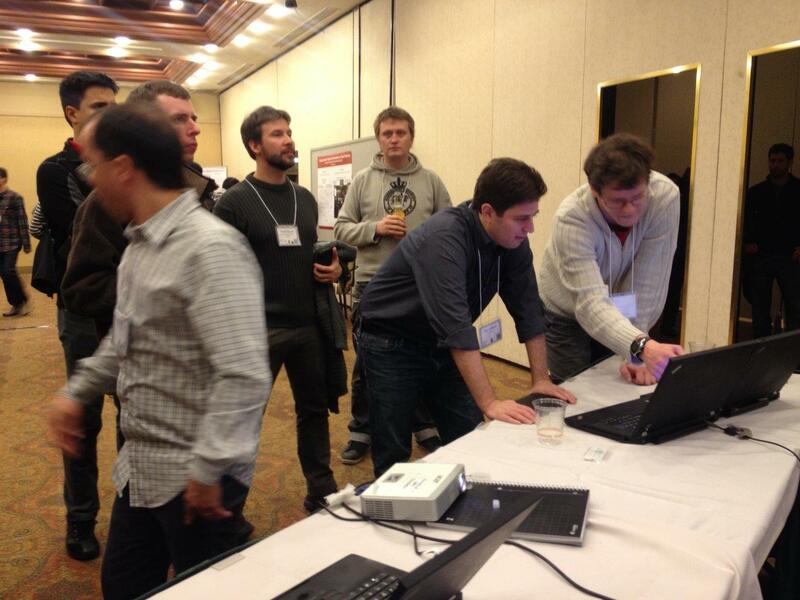 XLike helped organizing NIPS 2012 workshop on the cross-lingual technologies. All the talks were recorded and can be accessed through Videolectures.net. From the application side, there is a clear need for such cross-lingual technology and services. Available systems on the market are typically focused on multilingual tasks, such as machine translation, and don’t deal with cross-linguality. A good example is one of the most popular news aggregators, namely Google News that collects news isolated per individual language. The ability to cross the border of a particular language would help many users to consume the breadth of news reporting by joining information in their mother tongue with information from the rest of the world. The first year of the ongoing international project XLike is over. The project partners developed the first prototype tool, which is now also publicly available at Sandbox. The first prototype of the XLike tool is designed as a tool for automatic cross-lingual searching for the top entities and top stories in the news feed from all around the world (the news feed includes a few thousand news sites in different languages). At the moment the tool supports 4 languages (English, German, Spanish, Chinese). In the future it will include also several other languages, like Catalan, Slovenian, Croatian etc. 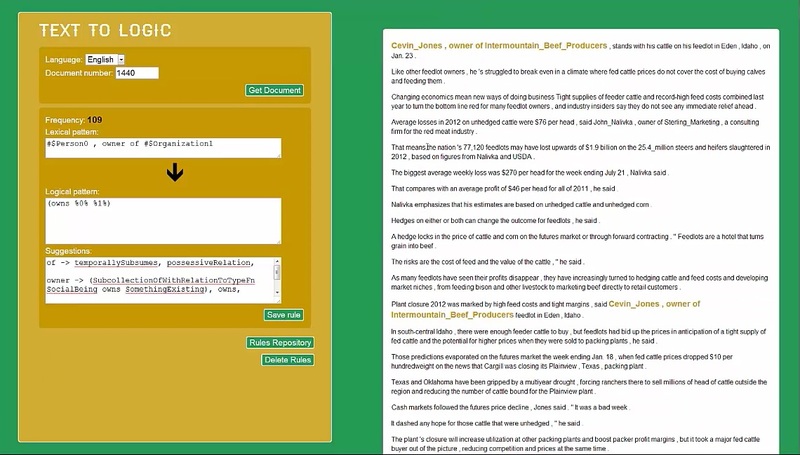 The tool enables users to adjust the search by time period of the published articles, language of the news articles and home country of the publisher. The results are visualized in following sections: list of top entities, list of matching articles, list of top stories, news map, time distribution of the articles, graph of the distribution of the articles by publishers, graph of the distribution of the articles per language ant a keyword cloud for related keywords. This means that users are able to find out for example the hottest entities for last 24 hours all around the world. Other possible uses of the tool are for instance searching top stories in a selected country in a selected time period or searching top stories about a selected entity or keyword in selected languages. The results are cross-lingual meaning that the search for English keyword “flood” includes also results for the same keyword in other languages. Articles are also automatically connected to similar articles from other articles. The XLike project is about data analytics, and there can be no data analytics without data. Therefore, one of the first tasks in the project was to acquire a large-scale dataset of news data from the internet. 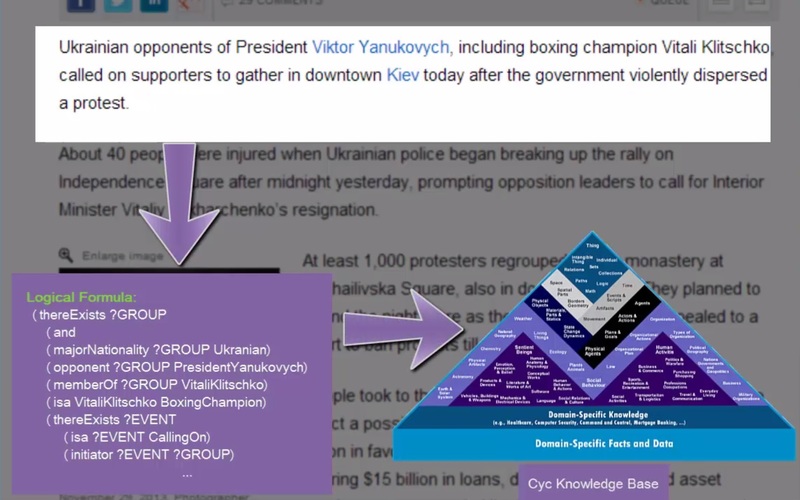 Exposes two streams of news articles (cleartext and Enrycher-processed) to end users. Check out the real-time demo at http://newsfeed.ijs.si/visual_demo/ (which does not show the contents of private feeds). The speed is bursty but averages at roughly one article per second. News articles obtained from the internet need to be cleaned of extraneous markup and content (navigation, headers, footers, ads, …). We use a completely heuristics-based approach based on the DOM tree. 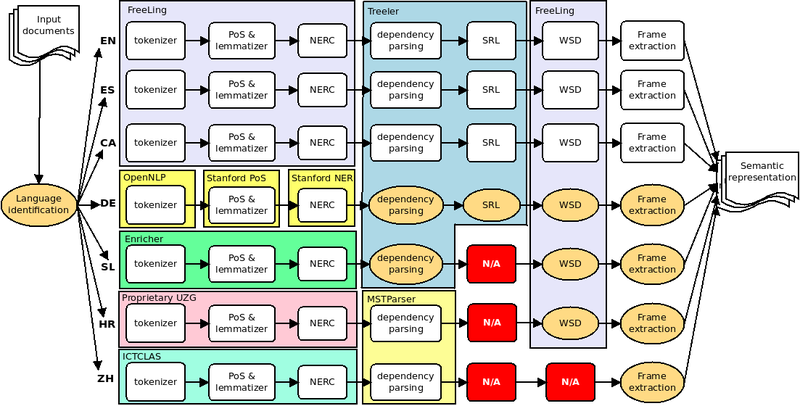 With the fast libxml package, parsing is not a limiting factor. The core of the heuristic is to take the first large enough DOM element that contains enough promising <p> elements. Failing that, take the first <td> or <div> element which contains enough promising text. The heuristics for the definition of “promising” rely on relatively standard metrics found in related work as well; most importantly, the amount of markup within a node. Importantly, none of the heuristics are site-specific. We achieve precision and recall of about 94% which is comparable to state of the art. One of the goals of XLike is to provide advanced enrichment services on top of the cleartext articles. Some tools for English and Slovene are already in place: For those languages, we use Enrycher (http://enrycher.ijs.si/) to annotate each article with named entities appearing in the text (resolved to Wikipedia when possible), discern its sentiment and categorize the document into the general-purpose DMOZ category hierarchy. We also annotate articles with a language; detection is provided by a combination of Google’s open-source Compact Language Detector library for mainstream languages and a separate Bayesian classifier. The latter is trained on character trigram frequency distributions in a large public corpus of over a hundred languages. We use CLD first; for the rare cases where the article’s language is not supported by CLD, we fall back to the Bayesian classifier. The error introduced by automatic detection is below 1% (McCandless, 2011). We cover 37 languages at an average daily volume of 100 articles or more. English is the most frequent with an estimated 54% of articles. German, Spanish and French are represented by 3 to 10 percent of the articles. Other languages comprising at least 1% of the corpus are Chinese, Slovenian, Portugese, Korean, Italian and Arabic. The aggregator consists of several components depicted in the flowchart below. 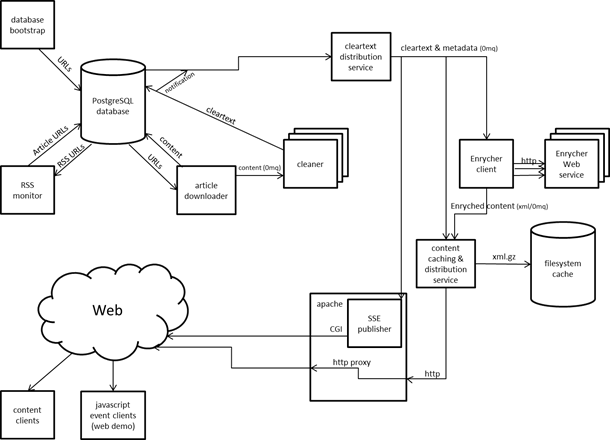 The early stages of the pipeline (article downloader, RSS downloader, cleartext extractor) communicate via a central database; the later stages (cleartext extractor, enrichment services, content distribution services) form a true unidirectional pipeline and communicate thorugh ZeroMQ sockets. We poll the RSS feeds at varying time intervals from 5 minutes to 12 hours depending on the feed’s past activity. Google News is crawled every two hours. All crawling is currently performed from a single machine; precautions are taken not to overload any news source with overly frequent requests. Based on articles with known time of publication, we estimate 70% of articles are fully processed by our pipeline within 3 hours of being published, and 90% are processed within 12 hours. Upon completing the preprocessing pipeline, contiguous groups of articles are batched and each batch is stored as a gzipped file on a separate distribution server. Files get created when the corresponding batch is large enough (to avoid huge files) or contains old enough articles. End users poll the distribution server for changes using HTTP. This introduces some additional latency, but is very robust, scalable, simple to maintain and universally accessible. The stream is freely available for research purposes. Please visit http://newsfeed.ijs.si/ for technicalities about obtaining an account and using the stream (data formats, APIs).